Not only will you want to buy your next mattress online after reading these six reasons, we’ve compiled a comparison of online mattress companies so that you can find the best mattress for your body and your budget! You can buy mattresses online cheaper than in-store because you cut out the middleman. Stores that sell mattresses have to pay the salespeople and overhead. Buying discount mattresses online saves you lots of your hard earned money. Having mattresses delivered right to your door for free saves time and money. If you don’t own a pickup to haul your new mattresses home, you’ll need to borrow from a friend or pay for delivery. Every online company that we recommend (keep reading for chart) offers free shipping. Since you can’t test out the mattresses by laying on them in the store, online mattress companies let you test them out in your home for a free trial period (and actually sleeping on the mattress is the best test). If you decide you don’t like the mattress, you can return it with no questions asked for a refund. Most companies even offer free return shipping. Nectar Mattress offer a 365 day free trial offer (see our review here). That’s a whole year of sleeping and “testing” out their mattress. 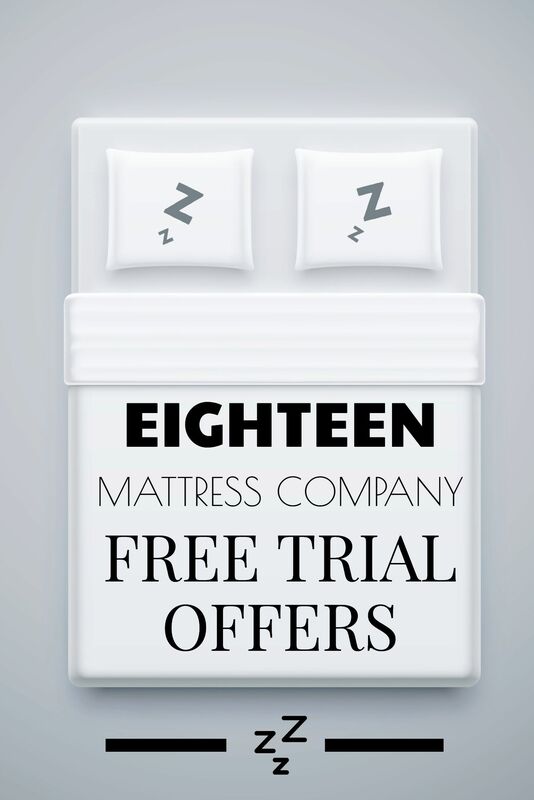 If you did every free trial offer that every mattress company offered (see list below), you’d probably never have to actually pay for a new mattress again! Many mattress companies offer deferred billing options so you can buy mattresses now, pay later. Our detailed list of mattress companies below spells out which payment plan method they use. Most of the stores accept Affirm and you can see how much your payment will be before ordering. Special financing options are available with no interest and no credit checks. Most mattresses come with a 10, 15 or 20 year warranty, but some even come with lifetime warranties, such as Puffy and Layla Sleep (see our review here). To ship mattresses, they compress and roll pack your mattress. Unboxing your new mattress is a fun process of watching your mattress come to life! Now that we’ve convinced you that you need to buy your next new mattress online, here’s a list of the best mattress companies online compared so you can decide which mattress is best for you! For price comparison, we’ve priced out the Queen mattress since it’s the most common mattress size purchased. Click each link for pricing on king size mattresses, full size mattresses, California king size mattresses, twin size mattresses and/or twin XL size mattresses. Dream Cloud $1399 Free Shipping & Pickup 365 days Accepts Affirm Lifetime! Sleep $795 Free Shipping & Returns 365 nights Accepts Affirm Forever! Sweet Zzz $685 Free Shipping & Returns 100 nights Accepts Klarna Lifetime! Prices and policies are subject to change. Click on each individual mattress company for more details. What about Saatva? I’ve heard it’s a top bedding site. How does it compare? Buying a mattress online sounds fine, as long as I feel secure in the quality of the mattress. I would definitely do some research & read reviews first, but I like the idea of having it conveniently delivered.